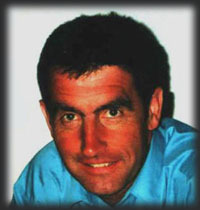 Roger Fuller now has a new website at www.canalnarrowboats.com this page is an archive only. ....................................Launch of BRUIZER for Mr & Mrs Clive Stevens, Spring 2002. 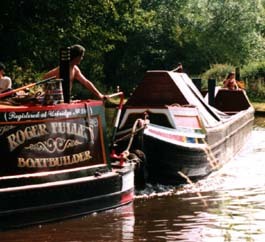 Welcome to Roger Fuller's website, the home of Five Towns Boatbuilding, and Historic Narrow boats. This website is free for you to browse at your leisure. The focus of attention is my company, Five Towns Boatbuilding, and a growing archive on Historic Narrow boats. F.T.B. was established in 1985, and has a reputation that was quickly established for quality work; we build boats up to a standard, and not down to a price. As a result, our work is in demand; no one is getting rich quickly, and we go home happy with a job well done. 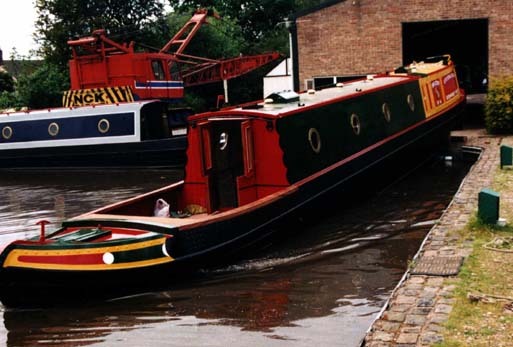 Historic narrow boats are an important part of our national heritage and formed a vital means of transport during the growing Industrial Revolution. Today, many of these boats are still with us, and the Historic Boats link, opens up a wealth of information on the companies, and the boats that they owned. An informed respect for these craft, means that today there are now more boats of this kind for us all to enjoy. Navigation House, 1 Whitebridge Lane, STONE, Staffordshire, ST15 8LQ. For our location map please click here. Thank you for contacting us.